The feeling of synthetic ice meets the ease of Dryland tiles with HockeyShot’s new patented Synthetic Ice Revolution tiles! These 18” x 18” tiles are lightweight, flexible and can be configured to fit any space. Easy to throw down and pick up, they’re perfect for home skating. 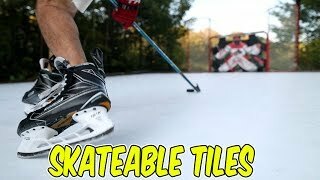 Let the revolution begin with the first ever skatable hockey tile! A revolutionary skating experience is here! Best of all it’s totally customizable for your indoor or outdoor space at home. 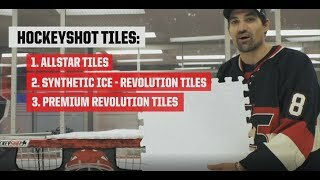 Presenting the most innovative hockey tile ever made: HockeyShot’s Synthetic Ice – Revolution Tiles! 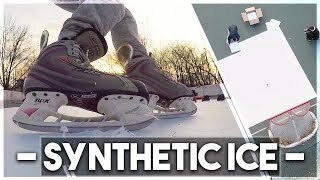 The smaller, lightweight, flexible Synthetic Ice design means you can throw-down and pick-up your artificial ice surface anywhere! Take home ice advantage to a whole new level. 45.7cm x 45.7cm x 1.1cm tiles are sold individually with no minimum order. Patented symmetrical tiles clip together in any direction. 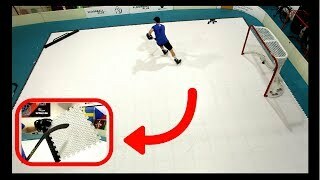 Assemble an entire surface in minutes! New and improved formula offers our slickest and smoothest skating & puck handling experience. Best coefficient levels of friction on the market. 10-15% greater than frozen ice means its perfect for resistance training! Self-lubricating agent means no need for wax or add-on liquids. Built with VHMW-PE for better performance and durability. UV protected and weather resistant to withstand outdoor cold and heat. Improved construction and lightweight, flexible design better accommodates uneven terrain while remaining strong enough to park vehicles on them. 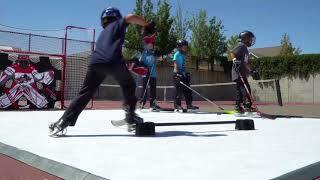 Easier and more affordable to ship than larger traditional Synthetic Ice panels. Enhance your tiles experience and keep the puck in play with our new Puck Stopper Edging Containment System or use our Smooth Edging for easy puck loading. Revolution Tiles come with 2-year warranty. Liked the product. Could be more affordable. It is not ice, but it works rather well at imitating it. You work your muscles a lot harder and once you get back on the ice, it feels like you're flying. Great product! 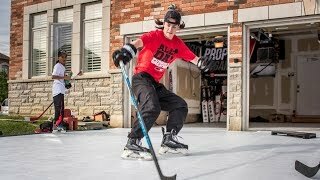 I would definitely recommend it to anyone looking for an alternative to an actual ice rink or a personal rink at home. Very good product. Sturdy and holds up after lots of use. Good, durable product. Gets lots of use. The kids like skating in the basement! It's a very good product. They are good to skate on. If you do not have a grippy surface to put them on they will shift when trying to make a more aggressive move like tight turns. These are awesome!!! My 6 and 7 year old love skating and using their sneakers on them. Great product! My 12 year old son loves them! This should complete our basement rink! Great item for training in the house! Excellent product, works as described. Almost like the real thing, the bit of friction helps with training but puck slides nicely.